The Vendor Performance Management tool is an effective way to monitor a vendor's performance through their interactions with buyers. It allows buyers to collect information from selected respondents on any given vendor through multi-question surveys. Buyers are able to configure as many surveys per vendor as they would like. Buyers can configure surveys for any given vendor, with one of several possible cadences (repeats) and can add any number of respondents via email. Cadences can currently be set to weekly/monthly/quarterly/yearly. 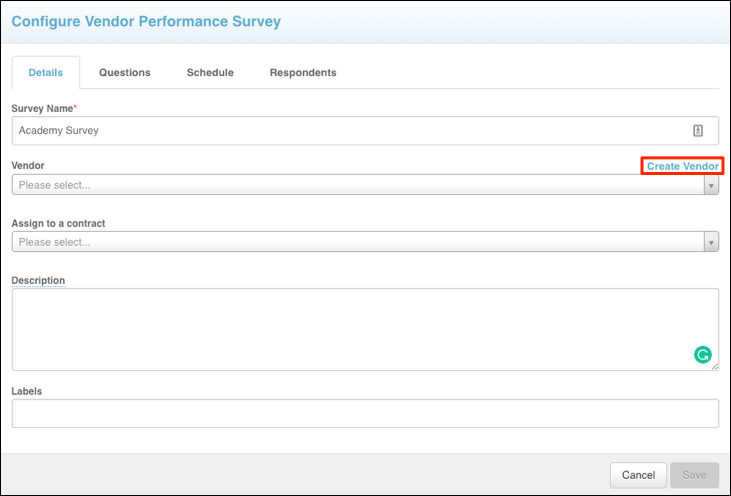 From here, click the Create button located within the Performance Surveys tab. Once you have opted to create a performance survey, a modal will appear on your screen. If you selected the survey creation option from the main Vendors module, you will have the option to select any vendor from the drop-down menu; you may also Create a Vendor during this step to allow for surveys to be made for vendors who may have not registered in Bonfire yet. Aside from this small distinction, the modal will be identical no matter how you choose to set it up. Under the Details tab, you can name your survey, specify which vendor it is applicable to, assign the survey to a specific contract, provide a description of the survey, and label it using your own labeling conventions. Once you have these details filled out you can move onto the next tab: the Questions tab. Every survey includes the original Net Promoter Score (NPS) question, asking how likely the respondent would be to recommend the Vendor to be scored on a 0-10 scale. This question cannot be modified. The Buyer can then indicate whether a text-based comment accompanying the rated response is required, optional, or not allowed. Aside from this question, the Buyer can customize the rest of the survey however they see fit, by adding Questions or Instructions. Order: the buyer has the option to use the arrows to reorder their questions. Upon clicking the arrow, that question will be automatically reordered to its new position, provided that the order number reflects a valid number within the survey. Keep in mind, the mandatory question must always be ordered 1. Answer Type: the buyer can indicate whether they are looking for a simple rating or a paragraph response. If they select Rating, they can choose either 0-5 scale or 0-10 scale. If you opt for the Paragraph option, the rating drop-down menu will freeze, indicating that the question will not receive a numeric rating. This action will also freeze the Comment column beside it, indicating that comments will not be allowed for that question. Comment: in the event that the question is receiving a rated response, the buyer can indicate whether a question is mandatory, optional, or not allowed. Required? : if the check box is selected, the question will be required; otherwise, it will be optional to the respondent. Actions: the buyer can either duplicate the questions, creating an exact replica directly below, or delete the question. By selecting the Instructions button, a new instruction will automatically appear at the bottom of the survey. Instructions are text notes for the survey that will be visible to the respondent but do not prompt any sort of response. They can still be reordered, duplicated, or deleted at any time within this modal. Frequency: the buyer can opt to send this survey out to its respondents one time only, or they can send it repeatedly at a given cadence; weekly, monthly, quarterly, bi-annually, or yearly. Survey Start: the buyer can select the date on which they wish to send out the first, or only, copy. Send Now: when this box is checked it will allow you to send the survey out to respondents immediately. In the case that the Send Now box is checked and the frequency is set to Once, the Start Date will be set to today and cannot be modified; therefore, if the box is checked and the frequency is set to anything other than Once you will be able to modify the Start Date. Survey End: the buyer can either select Never, in which case the survey will continually send out at the specified cadence; or they can select On, in which case they can select a specific end date. 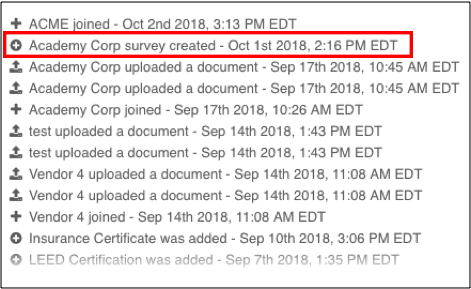 After the survey has been created, a notice will pop up in the top right corner of the dashboard, indicating that this action has occurred. Respondents: Use the drop down to select an existing account or enter the email address of the desired respondent. For those respondents who are not registered in Bonfire, the First Name & Last Name fields are editable. The buyer has the option to add respondents with the "plus" button on the right side. Furthermore, if you add yourself as a respondent you will see that your row in this tab has a greyed background, which is helpful to find yourself in the case that you're adding many different respondents to your survey. This tab will link to specific vendors and contracts whenever applicable. The Show Inactive Surveys button in the bottom left corner will open any additional surveys that have been marked inactive below. Engagement and Performance Rating is also displayed here and can be sorted from highest percentage to lowest percentage or vice versa using the arrow bars to the right of the heading. Engagement: engagement score is generated based on whether each respondent has responded to the survey in the last two cadences. 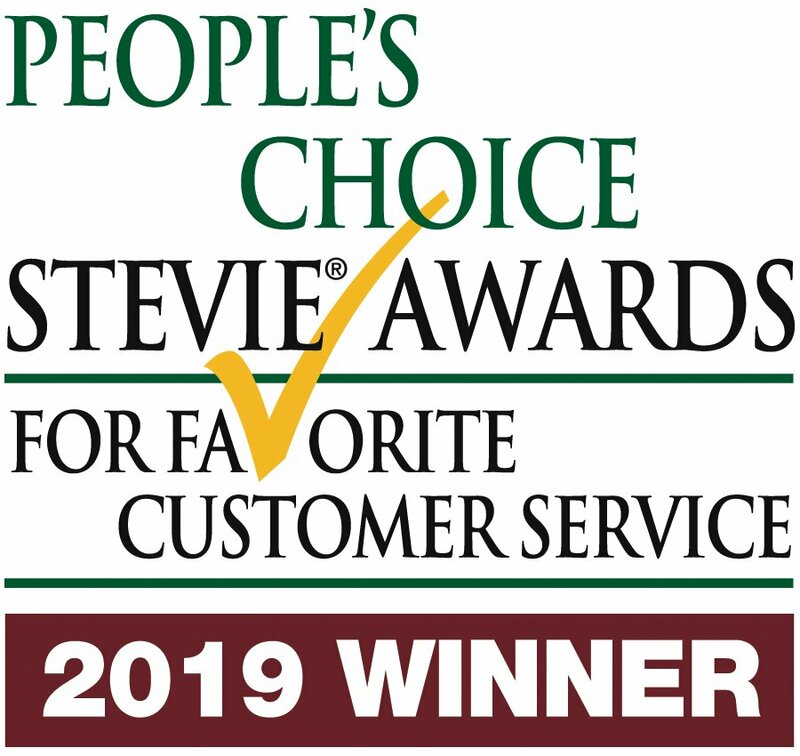 Performance Rating: this score takes the average rating the vendor has received across all respondents in the last two cadences; however, this score only pertains to the original NPS question in the survey. Under the Performance Surveys is the Scores tab which provides a summary of the survey information, a drop-down menu to view different surveys information, and the results colour coded in a table. Each respondent's answers are populated based on their last and most current response. You may also click on the Show Instructions button under the average scoreline to view any instructions that were provided for respondents. These instructions can be created in the Questions tab to help your respondents work their way through the survey. These are optional and you can run a survey perfectly fine without them if you so choose. Test Survey: send a test email to the current user's account, in which they can view the survey exactly how the respondent would view it. Download: download an Excel spreadsheet in which all responses to the survey are visible. Alternatively, you can use the Download All Items button located at the top of the listing to export an entire listing of all survey results. This role also grants the user access to the Vendor Management module, including access to all vendor profiles. This role allows the user to create, view, and edit Vendor Lists within any department. They may also merge Internal Vendors and create Commodity Codes for Internal Vendors. As of our 2018c8 release we now have the ability to set your organizations level of risk for surveys, contracts, and vendors. This section will focus specifically on At-Risk Vendors. Currently, both of these settings must be set by our support team or your CSM; once set, these will be the new thresholds placed on the organization. At your Vendor Dashboard, you will see the regular KPI's, in this case, we have an indicator for Vendors at risk if you hover over the dotted underlined text it will describe to you what exactly that means, including the value determined by your organization to be "At Risk". As of this release, the default risk threshold is set at 70% but can be adjusted by your Customer Success Manager or with help from our support team. A Vendors score is accessible on their Vendor Details Page and is displayed as an average of all survey scores associated with that vendor. In many cases, responses on surveys may no longer be relevant to one's score, in this case, we are able to set when a survey response should expire and be excluded in the calculation of performance scores. Similar to Risk Thresholding, this setting must be changed by your CSM or our support team. By default it is set to 90 days, after 90 days the survey response is dropped from the calculation. The Vendor Index Table under Vendor Records is one of the most important features of Vendor Performance Management. It allows you to quickly access key information on multiple vendors with a quick glance. Performance Trending Column - compares the current score to the score from 30 days ago. Example: if the score increased from 20% to 64% it would be displayed as an upwards green arrow with 44% in the column. Performance Standing Column - these labels identify the vendor's performance on a general level: If the vendor is at risk or in good standing. This allows for you to easily see which vendors are at risk without needing to know the risk threshold designated for your organization. Columns you select to Show/Hide will persist across sessions, such that if you use certain columns regularly and leave them shown on the table when you log out, they will automatically be showing on the table when you log in next. 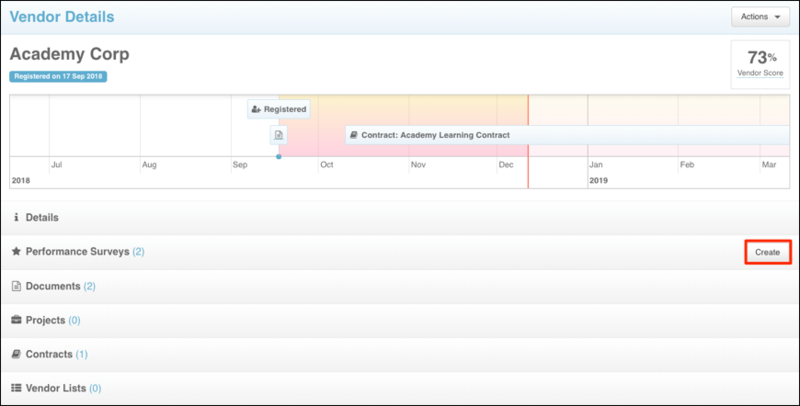 This functionality also works with the contracts index table, which we will cover in the next section of this course. Looking to quickly see a list of the data forming your Key Performance Indicators? On the dashboard for vendors, you are able to click on any of the text with a dotted underline (exclusive of the Survey Engagement KPI) in order to automatically filter the list for that data. TIP: This same feature works with contracts as well! Simply click on the "Contracts at Risk" text with a dotted underline and it will filter the contract table to show only At Risk contracts. You will see an orange highlighted filter icon on the column you filtered for from your dashboard as you can see in the Verification Status column in the image above. Similar to the Vendor Index/Records Table, you're able to filter data in a table format for all your organization's contracts. Navigate to the Contracts section of Bonfire and open the Contracts accordion menu. This shows you the table where you can Show/Hide different columns based on what data you need. Some columns relevant to Vendor Performance Management are Contract Performance, Performance Trending, and Performance Standing. These are all the same indicators referenced in the Vendor Records Table section, the only difference is they are specific to individual contracts in the table. Performance Standing Column - these labels identify the performance of the contract on a general level: If the contract is at risk or in good standing. This allows for you to easily see which contract are at risk without needing to know the risk threshold designated for your organization. This is a sample view of what the respondent might see once they open the survey; keep in mind, this will change based on the questions that are asked in the survey configuration process. Once the respondent submits their results, they are immediately recorded in Bonfire.